On the Ides of March of 44 BC, a day used by the Romans as a deadline for settling debts, the conspirators staged a game of gladiatorial sport at the Theatre of Pompey. The gladiators were provided by Decimus Brutus in case their services were needed. They waited in the great hall of the theatre's quadriportico. Caesar, however, was late, having received several warnings in the previous days. Therefore, Decimus Brutus was sent to fetch him, and managed to persuade Caesar to attend so as not to disappoint the Senate. Mark Antony, having vaguely learned of the plot the night before from a terrified Liberator named Servilius Casca, and fearing the worst, went to head Caesar off. The plotters, however, had anticipated this and, fearing that Antony would come to Caesar's aid, had arranged for Trebonius to intercept him just as he approached the portico of the Theatre of Pompey, where the session was to be held, and detain him outside (Plutarch, however, assigns this action to delay Antony to Decimus Brutus). When he heard the commotion from the Senate chamber, Antony fled. According to Plutarch, as Caesar arrived at the Senate, Lucius Tillius Cimber presented him with a petition to recall his exiled brother. The other conspirators crowded round to offer their support. Both Plutarch and Suetonius say that Caesar waved him away, but Cimber grabbed Caesar's shoulders and pulled down Caesar's toga. Caesar then cried to Metellus Cimber, "Why, this is violence!" ("Ista quidem vis est!"). At the same time, Casca produced his dagger and made a glancing thrust at the dictator's neck. Caesar turned around quickly and caught Casca by the arm. According to Plutarch, he said in Latin, "Casca, you villain, what are you doing?" Casca, frightened, shouted "Help, brother!" in Greek ("ἄδελφε, βοηθεῖ", "adelphe, boethei"). 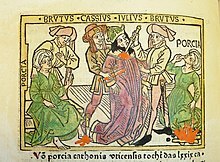 Within moments, the entire group, including Brutus, were stabbing the dictator. Caesar attempted to get away, but, blinded by blood in his eyes, he tripped and fell; the men continued stabbing him as he lay defenseless on the lower steps of the portico. According to Eutropius, sixty or more men participated in the assassination. Caesar was stabbed 23 times. Suetonius relates that a physician who performed an autopsy on Caesar established that only one wound (the second one to his chest that pierced his aorta) had been fatal. This autopsy report (the earliest known post-mortem report in history) describes that Caesar's death was mostly attributable to blood loss from his stab wounds. The dictator's last words are a contested subject among scholars and historians. Suetonius himself says he said nothing, nevertheless, he mentions that others have written that Caesar's last words were the Greek phrase "καὶ σύ, τέκνον;" (transliterated as "Kai su, teknon? ": "You too, child?" in English). Plutarch also reports that Caesar said nothing, pulling his toga over his head when he saw Brutus among the conspirators. The version best known in the English-speaking world is the Latin phrase "Et tu, Brute?" ("You too, Brutus? "); this derives from William Shakespeare's Julius Caesar (1599), where it actually forms the first half of a macaronic line: "Et tu, Brute? Then fall, Caesar." This has no basis in historical fact. Shakespeare was making use of a phrase already in common use at the time. [original research?] According to Plutarch, after the assassination, Brutus stepped forward as if to say something to his fellow senators not involved in the plot; they, however, fled the building. Brutus and his companions then marched to the Capitol while crying out to their beloved city: "People of Rome, we are once again free!" They were met with silence, as the citizens of Rome had locked themselves inside their houses as soon as the rumour of what had taken place had begun to spread. According to Suetonius, all the conspirators made off, and he (Caesar) lay there lifeless for some time, and finally three common slaves put him on a litter and carried him home, with one arm hanging down. A wax statue of Caesar was erected in the Forum displaying the 23 stab wounds. A crowd who had amassed there started a fire, which badly damaged neighboring buildings. In the ensuing years, the Liberators' civil war resulted in the end of the Republic and the rise of Imperial Rome. Virgil wrote in the Georgics that several unusual events took place following Caesar's assassination. Who dare say the Sun is false? He and no other warns us when dark uprising threaten, when treachery and hidden wars are gathering strength. He and no other was moved to pity Rome on the day that Caesar died, when he veiled his radiance in gloom and darkness, and a godless age feared everlasting night. Yet in this hour Earth also and the plains of Ocean, ill-boding dogs and birds that spell mischief, sent signs which heralded disaster. How oft before our eyes did Etna deluge the fields of the Cyclopes with a torrent from her burst furnaces, hurling thereon balls of fire and molten rocks. Germany heard the noise of battle sweep across the sky and, even without precedent, the Alps rocked with earthquakes. A voice boomed through the silent groves for all to hear, a deafening voice, and phantoms of unearthly pallor were seen in the falling darkness. Horror beyond words, beasts uttered human speech; rivers stood still, the earth gaped upon; in the temples ivory images wept for grief, and beads of sweat covered bronze statues. King of waterways, the Po swept forests along in the swirl of his frenzied current, carrying with him over the plain cattle and stalls alike. Nor in that same hour did sinister filaments cease to appear in ominous entrails or blood to flow from wells or our hillside towns to echo all night with the howl of wolves. Never fell more lightning from a cloudless sky; never was comet's alarming glare so often seen. Two days after the assassination, Mark Antony summoned the senate and managed to work out a compromise in which the assassins would not be punished for their acts, but all of Caesar's appointments would remain valid. By doing this, Antony most likely hoped to avoid large cracks in government forming as a result of Caesar's death. Simultaneously, Antony diminished the goals of the conspirators. The result unforeseen by the assassins was that Caesar's death precipitated the end of the Roman Republic. The Roman lower classes, with whom Caesar was popular, became enraged that a small group of aristocrats had sacrificed Caesar. Antony, who had been drifting apart from Caesar, capitalized on the grief of the Roman mob and threatened to unleash them on the Optimates, perhaps with the intent of taking control of Rome himself. But, to his surprise and chagrin, Caesar had named his grandnephew Gaius Octavius his sole heir, bequeathing him the immensely potent Caesar name as well as making him one of the wealthiest citizens in the Republic. Upon hearing of his adoptive father's death, Octavius abandoned his studies in Apollonia and sailed across the Adriatic Sea to Brundisium. Octavius became Gaius Julius Caesar Octavianus or Octavian, the son of the great Caesar, and consequently also inherited the loyalty of much of the Roman populace. Octavian, aged only 18 at the time of Caesar's death, proved to have considerable political skills, and while Antony dealt with Decimus Brutus in the first round of the new civil wars, Octavian consolidated his tenuous position. Antony did not initially consider Octavius a true political threat due to his young age and inexperience, but Octavius quickly gained the support and admiration of Caesar's friends and supporters. To combat Brutus and Cassius, who were massing an enormous army in Greece, Antony needed soldiers, the money from Caesar's war chests, and the legitimacy that Caesar's name would provide for any action he took against them. With passage of the Lex Titia on 27 November 43 BC, the Second Triumvirate was officially formed, composed of Antony, Octavian, and Caesar's Master of the Horse Lepidus. It formally deified Caesar as Divus Iulius in 42 BC, and Caesar Octavian henceforth became Divi filius ("Son of the Divine"). Seeing that Caesar's clemency had resulted in his murder, the Second Triumvirate brought back proscription, abandoned since Sulla. It engaged in the legally sanctioned murder of a large number of its opponents in order to fund its forty-five legions in the second civil war against Brutus and Cassius. Antony and Octavian defeated them at Philippi. Afterward, Mark Antony married Caesar's lover, Cleopatra, intending to use the fabulously wealthy Egypt as a base to dominate Rome. A third civil war broke out between Octavian on one hand and Antony and Cleopatra on the other. This final civil war, culminating in the latter's defeat at Actium, resulted in the final ascendancy of Octavian, who became the first Roman emperor, under the name Caesar Augustus, a name that raised him to the status of a deity. Marcus Tullius Cicero was not a member of the conspiracy and was surprised by it, but later wrote to the conspirator Trebonius that he wished he had been "invited to that superb banquet". He believed that the Liberators should also have killed Mark Antony. The conspirators had decided, however, that the death of a single tyrant would be more symbolically effective, claiming that the intent was not a coup d'état, but tyrannicide. ^ Suetonius (121). "De vita Caesarum" [The Twelve Caesars]. University of Chicago. p. 107. More than sixty joined the conspiracy against [Caesar], led by Gaius Cassius and Marcus and Decimus Brutus. ^ "Ides of March: What Is It? Why Do We Still Observe It?". 15 March 2011. Retrieved 11 June 2018. ^ Fuller, J. F. C. (22 March 1991). 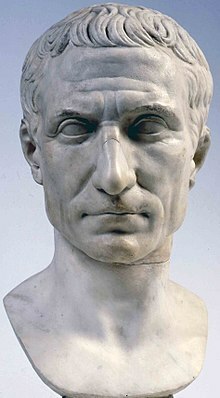 Julius Caesar: Man, Soldier, And Tyrant. Da Capo Press; Reprint edition. pp. 304. ISBN 978-0-306-80422-9. ^ Butler, M. Cary, ed., C. Suetoni Tranquilli, Divus Iulius [The Life of Julius Caesar], Oxford: Clarendon Press, 1927, Reissued with new introduction, bibliography, and additional notes by G. B. Townsend, Bristol: Bristol Classical Press, 1982. ^ Michael Crawford, Roman Republican Coinage, Cambridge University Press, 1974, p. 518. ^ Plutarch – Life of Brutus. The brother was Publius Cimber. ^ Plutarch, Life of Caesar, chapter 66: "ὁ μεν πληγείς, Ῥωμαιστί· 'Μιαρώτατε Κάσκα, τί ποιεῖς;'"
^ "Spot Where Julius Caesar Was Stabbed Discovered". Live Science. Retrieved 19 February 2017. ^ Suetonius, The Twelve Caesars, translated by Robert Graves, Penguin Classics, p.39, 1957. ^ It appears, for example, in Richard Eedes's Latin play Caesar Interfectus of 1582 and The True Tragedie of Richarde Duke of Yorke &tc of 1595, Shakespeare's source work for other plays. Dyce, Alexander (1866). The Works of William Shakespeare. Quoting Malone. London: Chapman and Hall. p. 648. ^ a b c Boatwright, Susan (2012). The Romans: From Village to Empire. New York: Oxford University Press. p. 260. ISBN 978-0-19-973057-5. ^ "Caesar's Personal Enemies on the Ides of March". JSTOR 41540686. 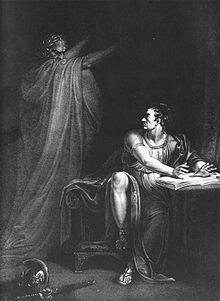 Wikimedia Commons has media related to death of Julius Caesar. Account of the assassination from the historian Appian. Section 114 contains a list of conspirators.